10. #OccupyDreams – If we all occupy dreams together, then we can all sleep our way into the top 1%. 9. #OccupyNightmares – It’s the easiest way for 99% of the people to get rid of the top 1% of nightmares. 8. #OccupyDaydreaming – Because paying attention the other 99% of the time isn’t fun. 7. #OccupySleepwalking – Because the top 1% of sleepwalkers can do things you wouldn’t believe, in their sleep. 6. #OccupyVisions – Because the top 1% of psychotropic users control over half the visions. 5. #OccupyLightSleep – Because being alert and staying sharp is the way the top 1% achieve their dreams. 4. #OccupyHeavySleep – It’s very tiring to protest day and night for months on end, so you won’t notice the noisy city sounds. 3. 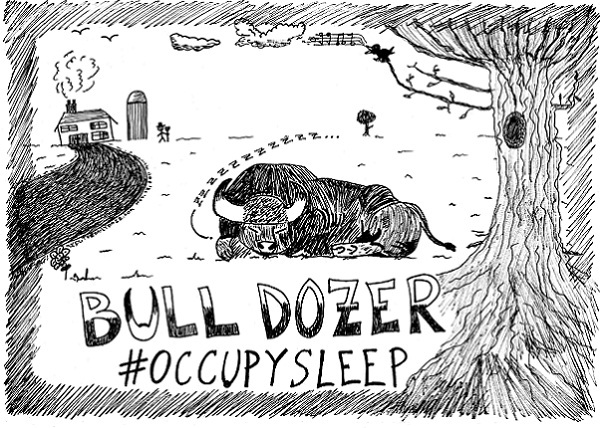 #OccupyNap – Sometimes half asleep is better than your other options. 2. #OccupyCatNap – Because the top 1% of cats p0wn half the naps from the other 99%. 1. #OccupySleep – Because the other 99% deserve more sleep.